If you ever doubt that God is always present in your life, try writing a weekly reflection! When one week is done, I am always looking to see where the next inspiration will come from. It is almost like a journal that I get to share with you. Well, this week was no different than the others. God is present in the ordinary! Ministry with immigrants and refugees has kept both Sr. Virginia Rozich and me super busy since last Wednesday, moving furniture, separating clothes, creating budgets and making a home for a family of five. Amidst all of these things, one of our sisters who is recovering from a serious accident called and asked if we could use some almost brand new clothing. Soon, we were off to pick up the clothes, then deliver them. When I saw Sister struggling with the bags, this quote from Timothy instantly came to me: “Preach the word whether convenient or inconvenient…” (2Tim 4:2). Despite all that was going on in Sister’s life, she was still taking the time to serve the poor, and with a great, big smile! When we finished packing the car, I told her she was an inspiration to me and pray that her healing continues to improve. As I sat in my car, all I could think was, “WOW, am I capable of that? Am I able to continue to serve God’s people (whoever they are, wherever they are) even if it is an inconvenience to me?” I really have to look at that. Perhaps, it may mean being cheerful when I have to do something I would rather not be doing or continuing to be cheerful when I am taken away from something that I enjoy doing so that I may help another. I could come up with so many examples of how to “preach the word whether convenient or inconvenient.” Have you ever found yourself in a situation that is inconvenient and your expression shows it? I have, but I am trying to get better at it. During this coming week, stop and recognize how you approach things when they are inconvenient. Perhaps an attitude adjustment may be necessary. I know I’ll be looking to find God in the next message He sends through both my convenient and inconvenient activities. 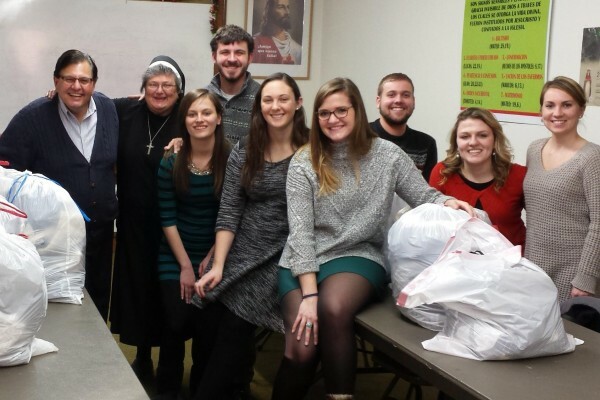 Pictured above: Sr. Theresita (center) with students and chaperones from Allegheny College's Newman Association, packing and sorting clothes at an immigration ministry in Chicago in 2016.